This is one of the best interior contrasts, and its biggest benefit is that a combination of black and white will always remain time relevant. A timeless decoration solution like this could never go wrong, and white glass TV stands will look simply gorgeous next to black glass coffee or console tables. Another impressive decoration solution is to contrast white with bolder, brighter shades. A classic interior decoration colour like white will look great next to any other shade you have in mind. 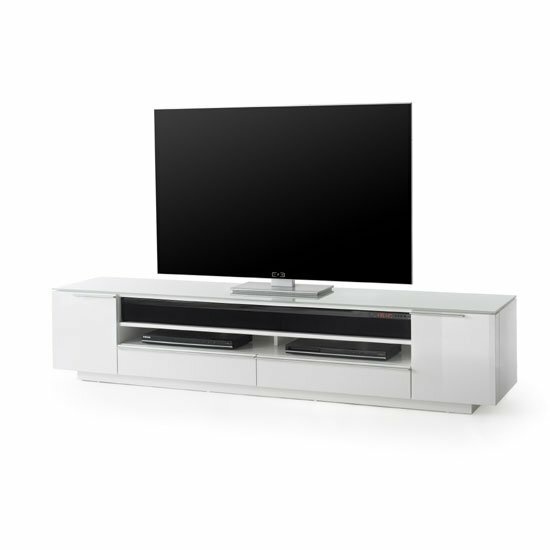 A very calm and interior friendly suggestion would be to install white glass TV stands next to beige or taupe walls. Or, three of the walls in your room could be neutral, while the fourth one can feature a bright shade. As of today, blue and dark green are some of the most popular interior colours. However, you can go with something even bolder — red, orange, etc. Yet another way to stylishly contrast white glass TV stands is to combine clear glass and tinted glass furniture in one room. Clear glass, similar to white one, will look astonishing in combination with any other tinted glass shade. For example, white glass TV stands and clear glass coffee tables is another combination that will remain relevant over the years. Another stylish contrasting option is combining tinted or clear glass with frosted one. The solution is perfect for modern rooms, and it creates the kind of subtle contrast while keeping your major decoration theme easy to trace. And, of course, few white glass TV stands will be made of glass and glass only. Some of the most impressive furniture material combinations is glass and high gloss, glass and chrome, glass and genuine wood. So, depending on the style your TV stand features, you will be able to find plenty of stylish furniture to match the picture. 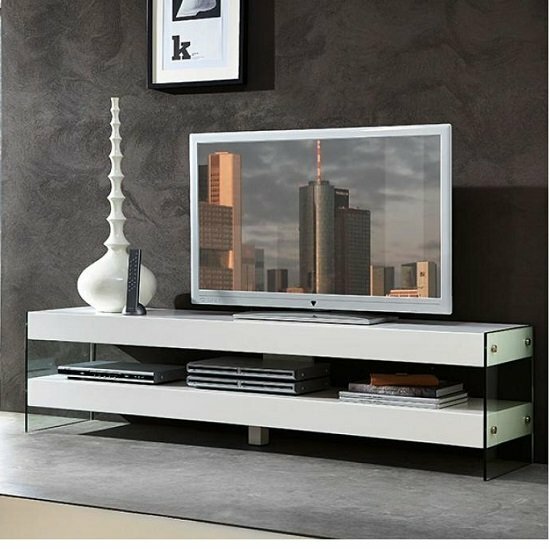 Plenty of white glass TV stands, as well as matching furniture arrangements can be found at Furniture in Fashion online store. This is one of the leading e-commerce stores in the UK, and apart from offering products online, it also gives shoppers a chance to visit company showroom in Farnworth and examine every furniture piece personally. Yet, given that this company works only with reputable manufacturers from the UK and Europe, the trip is not always necessary — you can stay absolutely confident in the highest quality of every single piece the store offers.